Promotional SMS is a SMS Containing text advertisement that explains about the product/service information sent to thousands of people. Promoting a Business or product or service or event via Text SMS is known as Promotional SMS. Promotional SMS is a form of mobile marketing where a Text SMS is sent to various numbers containing their sms advertisement that consist of product/service details or offers. The success of messaging service it is being used as business promotion activity in the form of mass sms. This form of business promotion has many unique capabilities and advantages which any business cannot afford to ignore. First of all the cost effectiveness of the promotional campaign by using mass sms service make it ideal for newly launched of small scale businesses. Small businesses to large business for promote their products or service. Hotels and restaurants for sending offers like discountsetc. Event organizers for sending event SMS like venue details date & time products or services available etc. Retail & sales to not only increase sales, but also build buyer loyalty and find new customers. Promotional SMS is used by any person or industry who wishes to promote their product or service and Increase their client base. Ink Web Solutions offers an ideal promotional bulk SMS service to your business which can directly generate sales and leads for your organization. A promotional message is a gateway to drive crazy benefits for your brand. All what matters is the content you send to your audience to educate them about your offer, product or services. We believe that promotional SMS works as a bingo to brands. 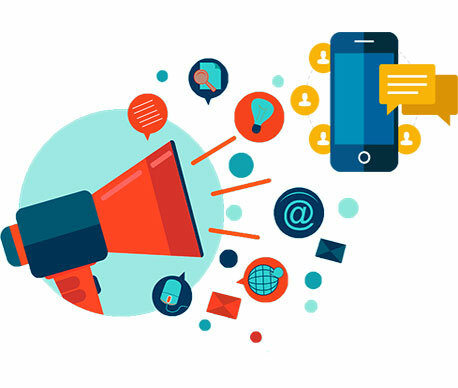 Our dedicated team of professionals considers all such points and helps you in best possible way to make your messaging campaign a big hit for your business. Chandigarh's Leading Promotional SMS Company ! Ink Web Solution provides Promotional SMS services in Chandigarh, Mohali, Himachal Pradesh and India. Promotional SMS Marketing used for Brand Promotion, Offers, Product Marketing, General Awareness, Event Publicity, Wishes like Happy Birthday, Happy Raksha Bandhan, Sales Follow-up. You can spread your band, product or any offer within a second in a single click. You can send your clients new offers, new products or any events right away.